The data NASA's New Horizons spacecraft collects during its historic flyby of Pluto today (July 14) may reveal insights into not only the dwarf planet, but also Saturn's huge moon Titan, scientists say. With its nitrogen and methane atmosphere, Pluto bears a strong resemblance to Titan — one of the most potentially habitable bodies in the solar system — or at least how Titan may have been in the past. 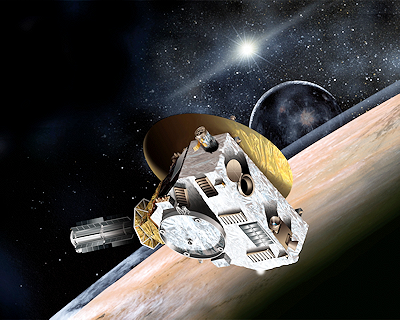 "New Horizons will help us confirm our photochemical understanding [of] Pluto. Since the photochemistry is similar to Titan, it will help us understand the processes there, too," said Michael Wong, a graduate student at the California Institute of Technology in Pasadena who worked with Yuk Yung, also of Caltech, and Randy Gladstone, of the Southwest Research Institute in Colorado, to study the possibilities of a frozen Titan. . . .